COMPETITION: BE PART OF A LUXURY LUNCH & CHOCOLATE TRUFFLE EXPERIENCE AND ENJOY SOME TIME BEHIND THE WHEEL OF A JAGUAR VEHICLE, 15 FEBRUARY 2018. 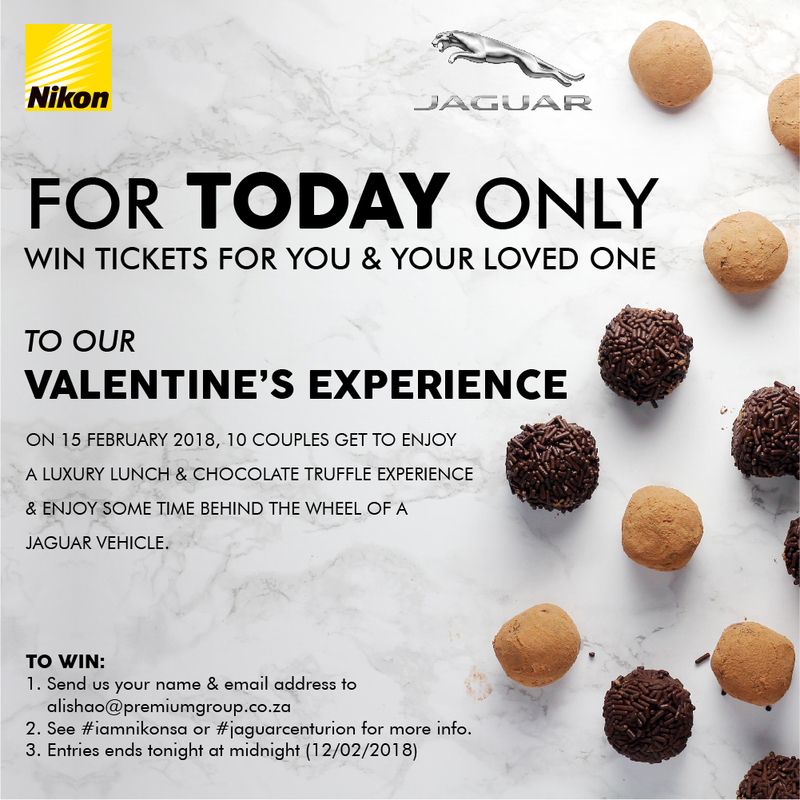 Nikon in South Africa, in partnership with Jaguar Land Rover Centurion invites you to indulge your senses this Valentine Month. Arrive at Jaguar Land Rover Centurion and enjoy some time behind the wheel of a Jaguar. Thereafter you will be introduced to the “History of Chocolate”on arrival at Casalinga Ristorante Italiano, Johannesburg with some chocolate tasting experiences. Get your hands dirty by creating your own deconstructed chocolate truffles. Use your imagination and creativity with the fruits, biscuits and nuts provided to make your own unique creations. Take your hand crafted truffles home. Finish off this culinary experience with a luxury lunch at Casalinga Ristorante Italiano, Johannesburg. Tickets for 10 couples to the Luxury Lunch & Chocolate Truffle Experience & Time behind the wheel of a Jaguar vehicle. – Please note: Only Entries from Gauteng can be considered due to the Venue.